Railway Recruitment Board (RRB) application process for recruitment for Ministerial And Isolated Various Posts. Earlier the last day for online registration was April 07, 2019, which is now extended to April 22, 2019. However, the closing date of fee payment is April 28, 2019. And the end date of the final submission of application is April 30, 2019. The link for online registration of application is mentioned below. 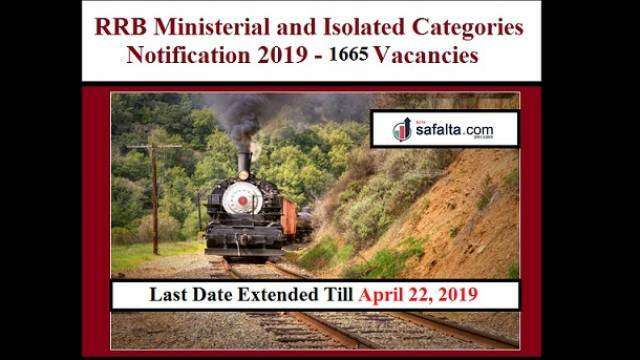 The candidates who are interested and not yet apply for the recruitment drive should visit the official website now to download the official notification and check all important details including Important dates, Eligibility Criteria, Application Fee, Selection process etc and apply now for the RRB Recruitment 2019. Selection will be based on the Computer Based Test (CBT). Required Educational qualification vary according to post. Candidates are advised to read detailed notification.